We’ve been having the most horrendous weather here in London for the past week. Thunder and lightening, monsoon rain storms and dark and dreary afternoons. Clearly summer has not arrived after all. It was the sort of rain that would have been quite fun if you were properly dressed, but with ballet pumps on just resulted in squelchy, cold feet! Needless to say, on arriving home, all I wanted was a warming, comforting meal and today’s recipe for Moroccan Lamb Meatballs was just the thing to warm me up. After my less than authentic lasagne recipe of last week, I’m not sure this really counts as an authentic Moroccan recipe either…are meatballs a typically Moroccan food?? When I hear the word meatball the thing that comes to mind is a meatball sub, dripping with tomato sauce and mozzarella, probably consumed in the US, not in a souk in Marrakesh. 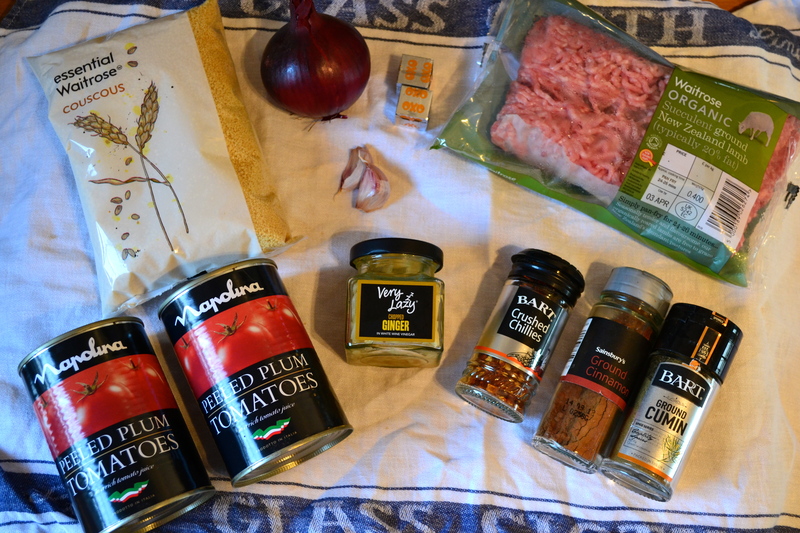 But whilst the Moroccan-ness of a meatball can probably be challenged, this recipe is definitely full of Moroccan-inspired flavours. Cumin, coriander, ginger, and garlic combine to flavour the succulent meatballs, which cook delightfully in their spicy tomato sauce. 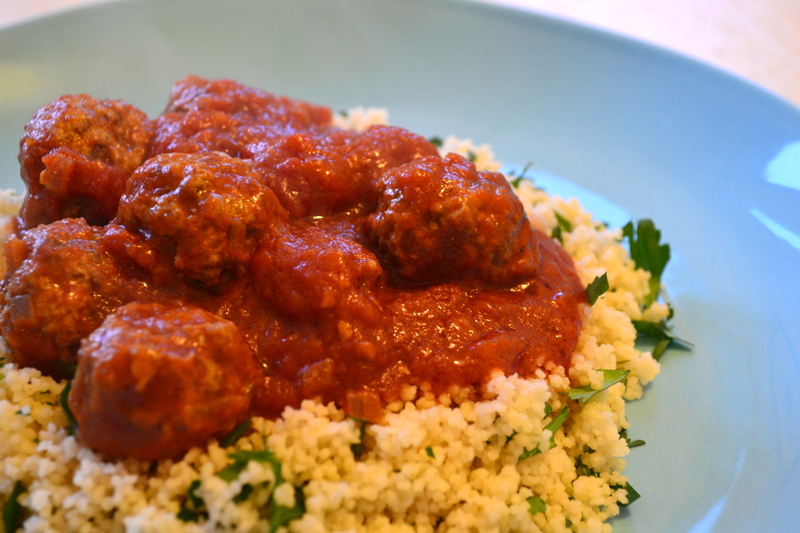 Served on a bed of fluffy, herby couscous, they are hard to beat. Ok, so this might not be the most photogenic plate of food in the world, but what these meatballs lack in the beauty department, they certainly make up for in taste and morishness. And they’re the perfect antidote to a rainy spring evening. 1. Put the lamb, onion, half of the garlic and ginger, and half of the spices into a bowl together with a little salt and pepper. Mix everything together well and then form into little meatballs about the size of a ping pong ball (you should make about 30). 2. Heat the olive oil in a large non-stick frying pan and brown the meatballs in batches**. Add the remaining garlic, ginger and spices and cook for 2 minutes. Add the tomatoes and stock and season to taste. 3. Carefully place your meatballs in the pan and allow the sauce to come to the boil. Reduce to a gentle simmer and cook for 30 minutes, stirring occasionally and turning the meatballs mid way through. 4. Towards the end of the 30 minutes, make your couscous. Place the couscous in a bowl, pour over the chicken stock and cover with cling film. Leave to stand for 5 minutes before fluffing up with a fork and stirring through the chopped coriander and parsley. 5. After 30 minutes the tomato sauce should have thickened. If not, turn up the heat for a few minutes to thicken it up. Stir through the coriander and then serve on a bed of couscous. * I use “Very Lazy Chopped Ginger” in a jar and use about a tablespoon of this, chopping it up finely. ** I usually skip this stage as a) I’m too lazy and b) I don’t notice the difference. 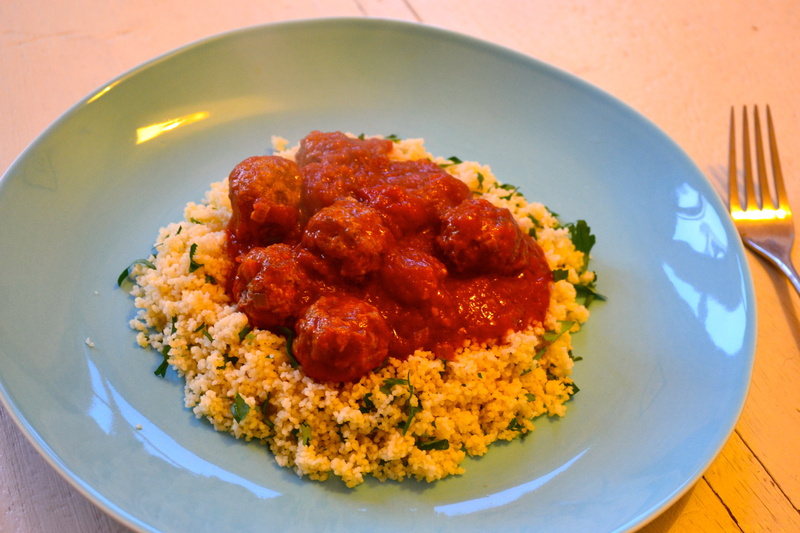 The raw meatballs can be prepared ahead and either frozen or refridgerated to be cooked the next day. The finished dish also keeps well in the fridge for a couple of days and can be frozen. The couscous is best made just before eating.